My introduction to Honolulu’s Kaka’ako neighborhood was hard and fast, and I liked it. On arrival, I was immediately ushered into cocktail-centric and appropriately named Bevy to clink Lilikoi-whiskey cocktails and other fruity concoctions––like, within a half hour of landing. I smelled like airplane and my hair had already begun to frizz from the island humidity. I didn’t care. I was surrounded by family, new friends, good drinks and the island intonation I hadn’t heard in nearly two years––and easily slipped back into during the seven days I was home. Kaka’ako is trendy yet local; friendly, inviting and casual. It is the island lifestyle elevated, yet it seems the fun I had while visiting is just the beginning of a 15-20 year plan to revitalize the area, according to Our Kaka’ako. Backed by Kamehameha Schools, the intent for a walkable, live, work, play environment with ample green space is already evident in the handful of small eateries and watering holes that dot the cross streets of Ala Moana Boulevard. 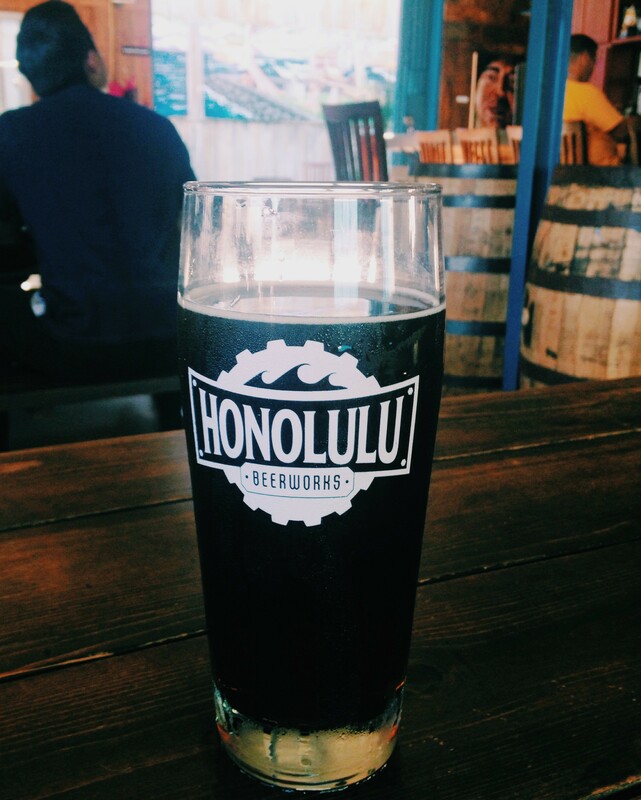 A pint at Honolulu Beerworks. On a mildly cloudy morning I ventured into the ‘hood again to enjoy an Acai bowl from smoothie chainlet Lanikai Juice, located in the new mixed-use building of The Collection. While waiting for my sister to get off of work on a separate afternoon, I wandered into the delightfully bright and airy space of Honolulu Beerworks and babysat a pint of their Makakilo Brown brew, and returned the next evening with an old high school friend for a round of tasters and another pint, this time enjoying their Vienna Lager at the cafeteria-style tables in the outdoor seating area. While I didn’t go in, the succulents and white space I saw from the windows of Paiko instantly reminded me of a similar shop (Pigment, across from Waypoint Public) in North Park, one of my favorite neighborhoods in San Diego. So did the parklet I discovered in front of a gourmet hot dog shop around the corner. From the colorful, refurbished buildings, approachable intimacy of its businesses and the opportunity to experience Kaka’ako as it emerges as one of the city’s “It” neighborhoods, perhaps that is why I found myself patronizing the area every other day. UPDATE December 2018: A lot has changed in Kaka’ako; more food, independent shops and places to imbibe. While “shiny and new” to some, it also has a deep, historical narrative that’s less-known. Read about it here in my multi-part travel guide to Honolulu for New York magazine.